The most effective procedure of restoration of hair loss for good long term results is the surgical correction. Before embarking upon hair transplantation we should know about all other procedures of surgical hair restoration. In scalp reduction surgery the bald area of scalp is progressively reduced in three to four stages by serial excision of the bald areas. Every time 3-4 cms of central strip of bald area is excised and the remaining scalp is advanced and sutured to cover the defect so created. This is repeated every 6-12 weeks. The obvious drawback is multiple stages, long time duration and scarring of the scalp. In scalp flap surgery the whole of the scalp is incised and divided into three to four areas. Then each of these areas is lifted as flap with blood supply based on one or more major blood vessels supplying the scalp. These flaps are then re-arranged so as to cover the bald area. It is technically demanding procedure with many obvious drawbacks and complications like: blood loss, long scars, mis-directed hair, hair loss and most devastating necrosis of the scalp flaps. The only rare indication of this procedure is use of single scalp flap to in patients who demand creation of dense frontal hair line. 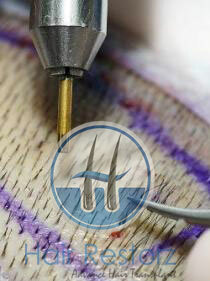 Scalp expansion using tissue expander is relatively not so old procedure. It has some role in management of baldness. In this procedure a balloon (tissue expander) is inserted in the hair bearing area of scalp adjoining the bald area which has to be covered. The tissue expander is then inflated with saline over the period of few weeks. When the scalp has expanded to the desired dimension then the expander is removed and the expanded hair bearing scalp skin is advanced to cover the bald area of the scalp. The major disadvantages of this procedure are scar in front of the hairline, misdirected hair and in rare cases necrosis of the expanded scalp flap. Hair grafting is the most common hair-restoration procedure performed these days. This is also the most common cosmetic procedure accepted by men world over. There are various techniques for hair transplantation with each having its advantages and drawbacks. Early on hair transplantation was done with micrografts (1-2 hairs) combined with minigrafts (3-5 hairs). Today with the refinement of the technique and introduction of newer modifications, most surgeons consider follicular-unit grafting as the Gold Standard procedure. In today’s hair transplantation procedure the non-hair bearing surrounding tissue is dissected away and only the follicular unit is transplanted at the recipient site. These follicular-unit grafts can be placed more closely increasing the hair density. There is reduced transaction rate and hence depletion of good follicle is minimised thereby increasing the hair yield from the strip of donor hairs. these follicular units are easy to be transplanted maintaining the natural direction of the hairs in that particular region making the results look natural. The follicular units can be obtained by either the strip technique (follicular unit grafting) or individual extraction (follicular unit extraction). Follicular unit extraction is preferred for younger men and those who wish to shave their head, because it avoids making a linear donor site scar.